Exquisite luxury condo in recently renovated Art Deco Historic Building, The Carlyle. 1250 Ocean Drive (corner of 13th Street) – one block from the Versace Mansion and The Tides – at the center of Ocean Drive restaurants and night life. The Ocean Front apartment has a spacious living/ dining room area with a separate bedroom and bathroom. All rooms have ocean views. 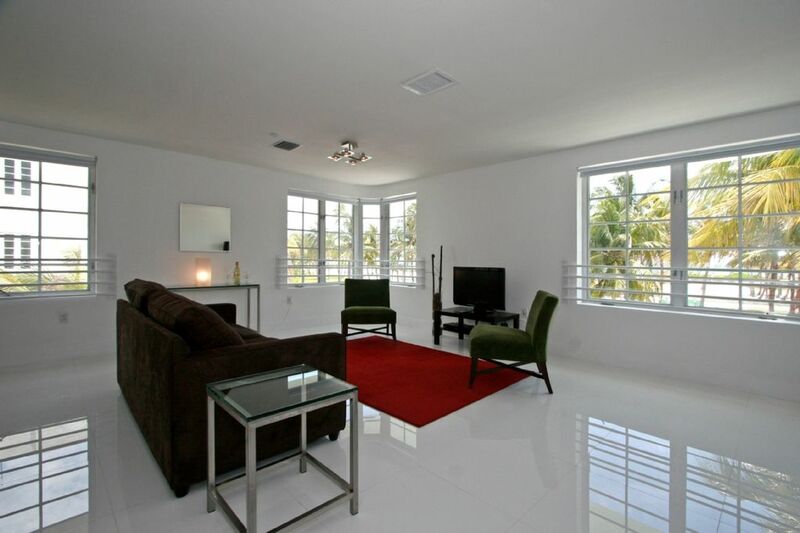 This is one of only two Carlyle units with corner views over Ocean Drive and 13th Street. Living Room has a plasma TV, DVD, free WiFi and exceptional ocean views. The Carlyle is Perfectly Located: Located in the heart of South Beach's restaurants, nightclubs and shops. Steps to the Ocean. Shopping on Ocean Drive and Collins Avenue (one block away). Trendy Lincoln Blvd is a short walk north. The Carlyle has Beautiful Amenities: Durazzo countertops. Nickel-finished Art Deco style plumbing fixtures. Subway-style tiled shower with Italian tile bathroom floor. Miele kitchen appliances with Subzero freezer/refrigerator. Parking available in public structure across 13th Street or valet. Welcome to our vacation home! we love South Beach and come by in a monthly basis. That allow us to take meticulous care of our beloved property. Spotless clean is fundamental to us. We met in South Beach, on the beach, and have always desired a second home here. The Carlyle has been our perfect vacation home, which we visit every six weeks at least. Ocean Drive condo located at the front of the building with direct views of the Atlantic and Lummus Park. White porcelain floors, Mielle stove, sub-zero refrigerator plus washer and dryer in unit. Luxury condo well maintained. Please no extra guests or parties allowed. Concierge will call owner and charges may apply. Two people ONLY. Todo me pareció muy bueno. Disfruté la estadía. Muy recomendable. We loved the location, the weather, fact that there was a coffee maker and a kitchen to cook our meals, and also for beach chairs and umbrella we could use, beach towels. The only improvement we would recommend is matresses - both in bedroom and foldable sofa - mattresses are hard and not what we used to (i.e. not usual hotel mattresses). Otherwise, we were happy to stay there and do all activities we planned in Miami beach. We loved Miami Beach and taking walks anytime of the day or evening. Condo is Close to everything. This was our second year staying here for an annual vacation. It's a great unit in a fantastic location, and it's very affordable. Highly recommend. Great location, clean, and spacious. We loved it. Great location, clean, and spacious. We would have preferred it if a few comfort items could've been stocked (in particular a box of kleenexes) but it's nothing a quick trip to the nearby CVS couldn't handle. We recommend doing a quick survey of things when you arrive, then making a run to the store. The concierges were friendly and accommodating. Check in/out was a breeze. You won't find a better location than this. Steps from the beach. Steps from Washington Avenue. And - perhaps my favorite part - steps from a Citi Bike station, where you can quickly and inexpensively rent a bike and go practically anywhere on the island. Thanks to David, Marcelo, and Lillian! Thanks for staying with us. I will talk to Lillian about Kleenex!! Please visit again. Great location! Clean and spotless!! Great apartment in a great location!! Everything about it is perfect, except that towels and bedding could use an upgrade. Great location. The bed is horrible. We ended up leaving early due to the bad bed. In addition the couch and chairs are so uncomfortable you can feel the wooden form under the padding. The owners need to make some improvements to the comfort level. It should be noted that we dis receive a prompt refund for our last two nights. We did promptly, without question, refund as you requested. We recognize that the sofa is a sofabed and can have a slight 'mechanical' feeling. But that compromise, we feel, is worth the benefit of guests having an extra place to sleep.